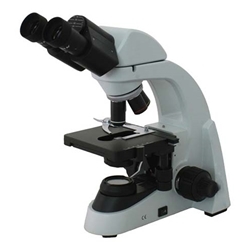 The Richter Optica UX-1B-ACHRO binocular achromat high power biological microscope offers quality optics at an affordable price point for High Schools, Universities and Veterinarians. Objective Lenses: DIN Achromat 4x, 10x, 40xR, 100xR (oil immersion) objectives, cover slip corrected. All microscope objectives are parfocalled, parcentered and color-coded. Quad objective turret is ball-bearing mounted for smooth, precise positioning of objectives, features textured rubber knurling for easy grip. Mounted in reverse position to facilitate ease in changing slides. Eyepieces: Widefield High Eyepoint Focusing 10x eyepieces / FN 18mm. Binocular Siedentopf viewing head with 30° inclined binocular eyepiece with interpupillary adjustment 50mm to 75mm. Left eyetube has diopter adjustment of +/-5. Retaining ring is available for eyepiece to accept 19mm diameter reticle.